One of Budapest’s hallmarks is the Hungarian capital’s lack of skyscrapers, which has preserved the city’s unique and historic skyline. The same cannot be said for even some regional cities, like Bratislava, and of course most western European capitals. This, however, is about to change with a 120 meter high office tower set to puncture the capital’s skyline. The new building, designed by London’s Foster + Partners, will serve as the headquarters of Hungary’s foremost corporation and a leading corporate name in all of Central Europe, namely the MOL Group, or in long form the Hungarian Oil and Gas Public Limited Company. There is a sense that such a powerful Hungarian firm, established in 1957 and with revenues of $25 billion per year, deserves to have a landmark building in Budapest and this appears to be part of the justification to proceed with an otherwise controversial proposal. The 120-metre glass office tower will be built in south Buda, near the Danube and a stone’s throw from the heart of the 11th District. This may not be the most central location, in terms of the historic downtown core, but it is near attractions such as Gellért Hill and will forever change the view of Budapest from the Citadella. This will become Budapest’s tallest building, pushing the dome of the Hungarian parliament and St. Stephen’s Basilica both to second place, with their height of 96 metres. It’s worth noting that Budapest does have examples of twentieth century high-rise architecture, though none comes close to the height of the new MOL Campus tower. 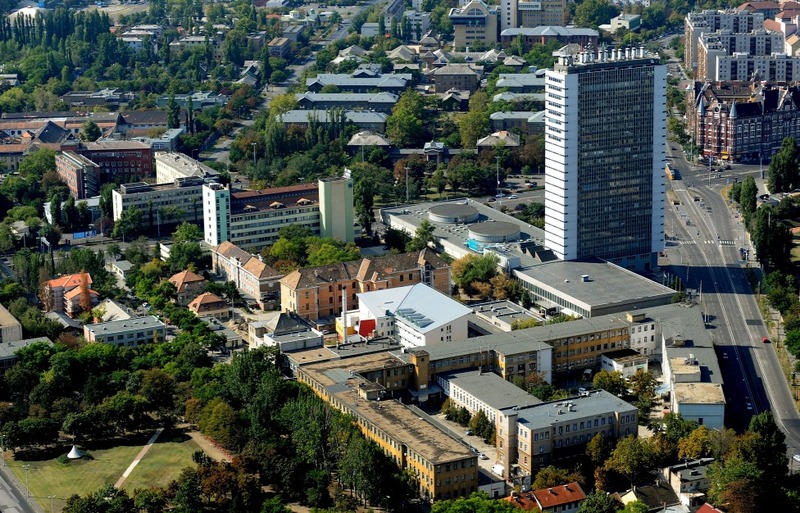 For instance, the Semmelweis University tower, built in 1976, stands at 89 feet. But its location outside the historic central core and away from the picturesque Danube and bridges, means that it is not particularly obstructive. (Although it is actually still visible in distant Pest, when the city is viewed from the hills of Buda). 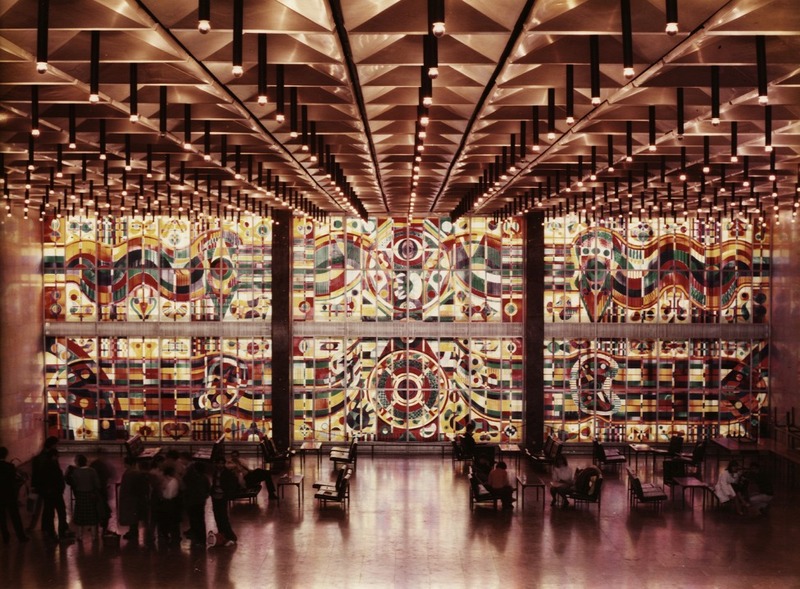 When built, the tower was Hungary’s tallest building and one of its redeeming qualities is a beautiful contemporary stained glass mosaic, standing at 7 metres high and 21 metres wide, designed by Gyula Hincz. The Semmelweis University tower in Budapest. Photo: MTI. Semmelweis University tower mosaic. Photo: University archives, from circa 1980. The other difference between the Semmelweis University tower and MOL Campus is that the former is a public space, open to all. The same cannot be said for the headquarters of a private corporation. 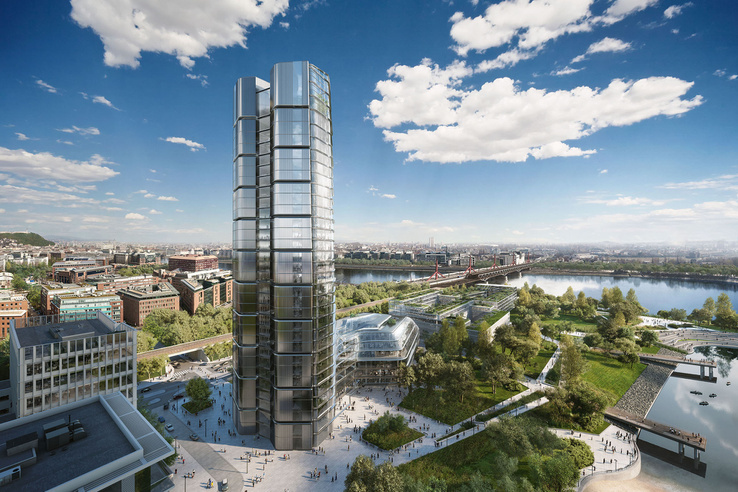 Architects at Foster + Partners do point to the fact that the tower will include a public look-out, offering a spectacular view of the Hungarian capital. Budapest’s former chief architect, István Schneller, begs to differ. Mr. Schneller, who opposes the planned construction, said that such corporate towers have strict security and card access gates in the lobby. It is doubtful that the public would be allowed easy access. Mr. Schneller also points out that in this part of Budapest, the maximum building height is 65 metres and this height restriction was confirmed in 2015. Why would the city agree to disregard this very recently developed guideline? The city decided to approve the project as part of an expedited review process, with little regard for opposing voices, nor for professional considerations. It strongly appears that corporate interests may have been given priority over public interests. From a pragmatic city planning perspective, there really is no justification for building skyscrapers in Budapest. Cities like Bratislava had no choice, but to build upwards, due to its proximity to the Austrian and Hungarian borders, and the lack of space. But in Budapest, no such pressure exists. Space is plentiful all around Budapest. Those critical of the plan also argue that merely because a building is large does not mean that it will become a true landmark or symbol of Budapest. In fact, none of the new, modern landmark structures built in central areas near the Danube have managed to become true symbols. These include the National Theatre (Nemzeti Színház), the more recently built Duna Arena, which is questionably billed on the FINA website as “Budapest’s new wonder,” or the Palace of Arts. There is no question that the MOL Group tower was designed by star architects from western Europe. But do they truly understand or appreciate the historic and natural character of Budapest–the interplay between the hills of Buda, the bridges, the Danube and the architectural harmony of the city centre? Whether Budapest’s leadership will reconsider, and whether it can do such a thing at this late stage, is doubtful. Just read it on Hungary Today, that MOL is going to build a 28 strorey office building in Budapest. Who would say that nothing new may happen there. But some are opposed to it already. May be it would be better, in the mind of some, if they used the Kobanyai caves for offices. Any way, it is a step for progress. A few hours after we published this piece, the Hungarian government announced that it opposes the current proposed design for the skyscraper and that if a skyscraper were ever built in Budapest, it would have to be a truly architecturally “unique” and innovative structure. Apparently, the government now agrees that the current skyscraper proposal threatens the Buda skyline. This puts the national government at odds with the Budapest municipal government. That puts the government and the entire country at add with progress. What an idiotic and backward idea that the government do not permit anything being built taller than their Parlament building. And they dare to call this a democracy? Back to the middle ages ! Can they give just one reason why they opposed to progress? Likely because they want nobody to feel taller than their Parlament. That way they feel really tall and in power. I hate today’s so called modern architecture, but there is no other way in large cities, but to go up and up. That is what life’s progress is. Yuck! That glass building belongs in London or Shanghai, but please, not in Budapest. There is a rule in Washington DC that no buildings can be higher than the Washington Monument. This has kept the character of the city intact. However in Northern Virginia, and in Maryland, there have grown up skyscrapers and an energetic business community. I applaud this decision of the Hungarian government. But than why not get rid of all the cars? Ox-carts and horse and buggies would be more economical and more nostalgic too. Just why not oppose all form of progress? Hm??? At first they opposed it there too. In London it was prince Charles that led the fight against modern sky-scrapes, but evidently he lost. Progress is usually always opposed at first, but finally progress wins. Fair enough, progress is important. As per Gretchen’s comment, is it possibe to designate an ‘industrial park’ AWAY from the city core, linked with a high speed train or express tram? That way the centuries old nostalgia remains in tact near the river, but in the distance you can see all the new shiny tall glass towers.